Note: There are two versions of this program on the same DVD: 86-minutes and 50-minutes. Seinfeld mocked it. Letterman put it on one of his Top Ten lists. 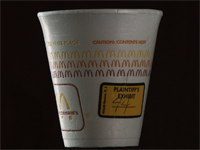 More than 15 years later, the McDonald's coffee case continues to be cited as a prime example of how citizens use "frivolous" lawsuits to take unfair advantage of America's legal system. But is that an accurate portrayal of the facts? First-time filmmaker and former public interest lawyer Susan Saladoff uses the infamous legal battle that began with a spilled cup of coffee to investigate what's behind America's zeal for tort reform. By following four people whose lives were devastated by the attacks on our courts, this thought-provoking documentary challenges the assumptions Americans hold about "jackpot justice." "As a Torts professor, I was riveted to the screen as the movie illuminated many of the issues and injustices currently plaguing our tort system. The students very much enjoyed the real life stories that poignantly illustrated the legal concepts we had been studying. There was a buzz around campus for a couple weeks and the conversations in the hallways and in the classrooms revisited the heart-wrenching struggles that those featured in the movie were going through. This is a must-see movie for those interested in tort reform and legal justice." "Hot Coffee is a provocative exploration of Big Business' campaign to weaken the civil justice system. Those who believe the nation is suffering from frivolous lawsuits may discover that they were led to that view -- not by facts -- but by clever propaganda." "This is a film that every law student, and everyone else interested in our civil justice system, should see, think about, and discuss with others, ideally in a public event after just seeing the movie. While our civil justice system is the best in the world, Hot Coffee makes it clear that it is being threatened in very frightening ways. The issue for us all is, what can and should we do to see that justice is a reality and not just a slogan?" "Hot Coffee serves as a wake-up call for Americans to question changes in the judicial process under the guise of tort reform before those changes destroy our system of access to justice." "For two decades, there has been an attack leveled against our civil justice system, fueled in large part by the 'outrageous' verdict entered in the infamous McDonald's case. Hot Coffee levels the playing field by telling the true story behind this decision, highlighting the important role lawyers and our civil justice system play in insuring a safe and effective marketplace. This movie should be part of everyone's education." "Too often, people don't understand how little oversight exists on product design until they are injured and seek compensation for a poorly designed product. At that point, they realize how much the tort reform movement has eroded civil rights. Hot Coffee brings critically needed attention to this misunderstood and much maligned area of law, which was meant to protect Americans from the injurious consequences of poorly designed products. This superb movie should be seen by every US citizen." "Hot Coffee is about the destruction of our Tort law -- there is nothing like it. A documentary about the lies that let to 'tort reform.'" "Hot Coffee does an excellent job presenting their stories. There are also particularly strong women spokespeople and role models...A good choice for constitutional law or pre-law classes. This film would capture the interest of most students." "A stunning debut with the lively, lucid Hot Coffee, about the spin behind such notions as tort reform, frivolous lawsuits and jackpot justice. With its energetic pacing, bold visuals and the kind of narrative that sends audiences out of the theater thinking in a brand-new way about something they thought they understood, Hot Coffee deserves the kind of release enjoyed by An Inconvenient Truth and Food, Inc."
"Saladoff...uses the McDonalds coffee case as the starting point and from there builds a strong case that tort reform, binding arbitration and non-economic damage caps subvert justice and benefit big business." "Eye-opening indictment of the way big business spins the media." "Infuriating, shocking, riveting and one of the best legal documentaries we've seen in a long time." Includes the original 86-minute version and a 50-minute version of the film, plus SDH captions for the deaf and hard-of-hearing, scene selection, and five extras: FRANK LUNTZ: THE WORDS MATTER [2:14]; INSURANCE RATES [1:27]; INTERVIEW WITH DIRECTOR [6:01]; HOT COFFEE, MISSISSIPPI [1:53]; TAKE ACTION: WHAT YOU CAN DO [1:04]. Also includes on DVD-ROM part of the disc an excellent discussion guide covering the four cases, and a bibliography.